Kenya is the home of the safari tradition and a Kenya safari will take you some of the finest wildlife parks in the world. Safaris in Kenya take place in the country’s more than 54 national parks and reserves where visitors can see numerous wild animals including the Big Five (lion, elephant, buffalo, rhino and leopard) and over 1,070 species of birds. It’s the world’s most famous game reserve and offers excellent big cats encounters. 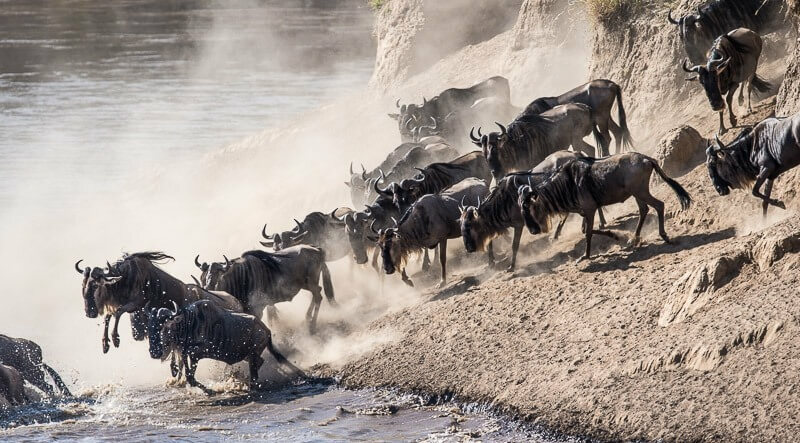 Visitors can witness the great wildebeest migration between July and October as over 2 million herbivores trek from the Serengeti plains in Tanzania right through the reserve and back again. The Mara is also one of the best places to take a balloon safari. Lake Nakuru is home to the greatest bird spectacle on earth. More than a million flamingos and pelicans can be seen here. Lake Nakuru National Park is also a sanctuary for the endangered black rhino and rothschild’s giraffe. Dubbed ‘Land of the Giants’ because of the huge population of African elephants, Amboseli is a birdwatcher’s paradise and home to numerous plain animals. It offers spectacular views of Mt. Kilimanjaro (Africa’s highest mountain). Situated in northern Kenya, Samburu is a game watcher’s paradise and has a pleasant aura of vastness and seclusion. All the Big Five can be seen as well as more than 450 species of birds. The grevy’s zebra, kudu, reticulated giraffe and gerenuk are unique to Samburu National Reserve. Mount Kenya is Africa’s second highest mountain. It offers easy or challenging ascents with spectacular scenic beauty. The mountain’s highest peaks are Batian (5,199 m), Nelion (5,188 m) and Point Lenana (4,985 m). There are tailor-made tour packages that let you visit these and other destinations. The tours can be customized to meet individual requirements.